Guide to the Teacher Incentive Fund (TIF) for California School Districts. The Federal guidelines for the $439 million Teacher Incentive Fund (TIF) grant program have been published, and the deadline for applications is July 6, 2010. Julia E. Koppich has complied the "Guide to the Teacher Incentive Fund (TIF) for California School Districts." The guide is intended as a resource for districts that plan to apply or are considering applying for a TIF grant in 2010. Even if you are familiar with TIF regulations from previous years, we encourage you to review this guide as program regulations have changed substantially. Click here to view and download a copy of the guide. 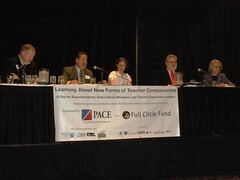 Click here for a full recording of the PACE and Full Circle Fund online webinar for California districts as per the Wednesday, June 9, 2010, webminar. US Department of Education official Jo Anderson, as well as Julia Koppich, one of the leading experts in alternative teacher pay model and author of the "The Guide to the Teacher Incentive Fund for California School Districts" will be discussed TIF and answered questions. New ways of compensating teachers in an era of ferocious budget shortfalls was the topic of discussion for about 400 school superintendents, leaders of teacher organizations and school board members from across California at conferences on March 30-31 in Oakland and Los Angeles. The conferences were organized by Full Circle Fund, a philanthropic organization in the San Francisco Bay Area and by Policy Analysis for California Education (PACE), a nonpartisan and independent research center based at the University of California, Berkeley, the University of Southern California (USC) and Stanford University. Below are some of the presentations and handout materials that were presented at the conference. We will add additional materials, as well as audio and video as they become available. You can find additional information about teacher compensation reform on the websites listed below. You can find additional information about Full Circle Fund below.